You may have a live cat or two, or one or more feline plushies of various sizes. But do you have a Cactus Cat? Doubtful, because until now, Cactus Cats were a snippet in American folklore and perhaps some stickers on the Internet. 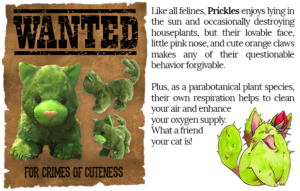 Now you can have your very own Cactus Cat to hug, hold, and befriend. 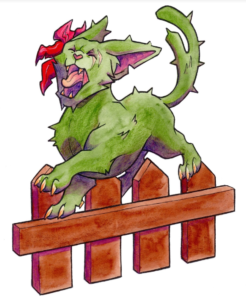 The Cactus Cat originated as a mythical creature in Southwest American folklore. As legend has it, cowboys and pioneers would report seeing prickly creatures with “thorn-like fur and a branched tail” roaming the deser t.
These feline-like plants would slash open cacti with their claws and drink deeply from the exposed sap. Apparently, drinking the sap caused the cats to become intoxicated. After they drank their fill, they would drunkenly stumble back into the desert and out of sight! Not a bad life, huh? But the story doesn’t end there. These strange inebriated felines also became famous for their distinctive “yowl” that carried across the quiet desert nights. In reality, this was probably a puma, but the idea of a drunk cat caterwauling to the moon is much more entertaining! And cuter! So the Cactus Cat became an official entry in our Compendium of North American Cryptids & Magical Creatures as its existence was confirmed by cryptozoologists and parabotanists across the Magimundi. The cactus cat is a cryptid found in the Baja Province. It resembles a large feline about the size of a bobcat with a spiky coat and a branching tail. However, it is not a mammal at all, but a fast-moving mobile cactus, which uses mimicry to look like a cat. The cactus cat does not put down roots. It obtains nutrients by slashing open normal cacti and drinking the sap, often waiting a day or two for the sap to ferment. Drinking heavily of this mezcal-like substance will intoxicate the cactus cat, which will then dance, stumble around, and make loud yowling sounds through the night. Cactus cats are green and can photosynthesize but still require the sap of local cacti for nutrients. They have four feet, with razor-sharp claws, as well as a traditional cat’s face, with eyes, ears, a nose, a mouth, and spiky whiskers. These all seem to perform the same sensory functions as they do with an actual cat, allowing the cactus cat to see, hear, and smell, and use the whiskers for balance and sizing. They do not appear to have any sense of taste. Cactus cats do not breathe as mammals do, but “inhale” carbon dioxide and “exhale” oxygen as part of photosynthesis. They are able to vocalize and their drunken night caterwauling is a memorable experience. They can also purr. Cactus cats do not have typical mammalian internal organs but possess a spongy interior similar to a cactus. They do not seem to feel pain, but dislike and will resist being cut. Cactus cats also have an internal sap which is highly alcoholic and magical. Cactus cat sap (colloquially called “cat juice” or “catsap”) is supposed to be able to get one pleasantly drunk with just one sip; however, it causes a wicked hangover the next morning. It is a magical hangover, immune to all charms and attempts to dispel it. Both male and female cactus cats will flower in the late summer. The flowers appear around the neck or head area of the cat and can give the appearance of wearing a hat, brooch, or pendant. Cactus cat flowers are usually dark red, pink, or purple and have a pleasant scent with a touch of mezcal. Cactus cats live in family groups in the wild, with both male and female alternating as leaders. Once the cactus kittens mature, they leave to form their own family groups. Cactus cats are fiercely protective of their space and mark their territory with scent. However, cactus cats from many different territories are known to congregate when drunk for a group yowl. Making a Cactus Cat plushie has been an interesting journey, from translating the concept and drawing to finding just the right shade of green to solving the branching tail design. We think you’ll agree that the resulting plushie is uber cute and ready to come home with you! The project will launch on Kickstarter on June 10, 2017 and your very own Prickles will be on your lap before the December holidays.